Canada’s navy in 1914 consisted of two obsolete cruisers, HMCS Rainbow and HMCS Niobe, with fewer than 350 sailors. 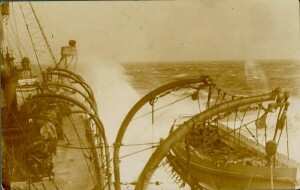 During the war, the navy would expand in response to the threat of German U-Boats. 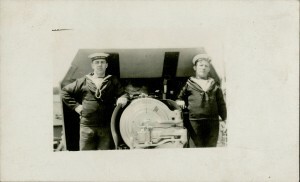 Canada’s obsolete navy was unprepared for war, with only two under-equipped warships. 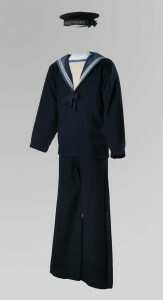 The protection of Canada’s coasts was entrusted to the Royal Navy. 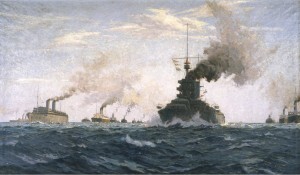 But when the war started, the Royal Navy was occupied in locating and fighting German squadrons, leaving Canada largely defenseless. 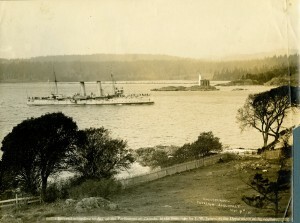 Before the war started, reports indicated that German warships were headed for Canada’s west coast. HMCS Rainbow, stationed at Esquimalt, British Columbia with a partial crew and lacking proper ammunition, was Canada’s only naval defence against German warships that would surely have destroyed it. Fortunately, the Germans never planned to raid in Canadian waters, but the perceived danger of enemy attack had a substantial influence on Canadian naval efforts. 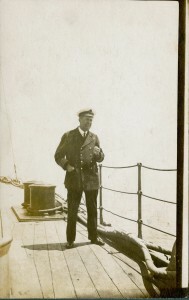 British Columbia Premier Sir Richard McBride secretly purchased two submarines from a shipyard in the United States. After significant work on submarines to get them seaworthy, they patrolled the west and east coasts during the war, but never saw action. 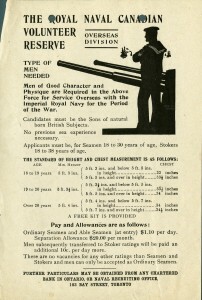 To make up for the shortage of Canadian warships, several patriotic citizens loaned or gave their personal yachts to the navy. Other vessels were built by the Imperial Munitions Board. 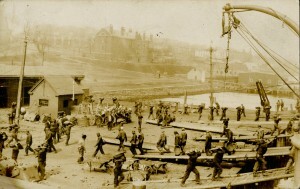 By war’s end, 100 small vessels had been pressed into service, most of them based in Halifax. In the summer of 1918, German U-Boats raided Canada’s east coast, attacking vulnerable ships. Canada’s small navy had little success in bringing the U-Boats to battle, but the war ended before the Germans did much damage. 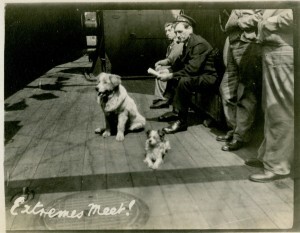 With enemy U-Boats causing serious losses to Allied merchant shipping, the Canadian government decided in early 1918 to establish and operate a strong merchant marine, the Canadian Government Merchant Marine (CGMM). 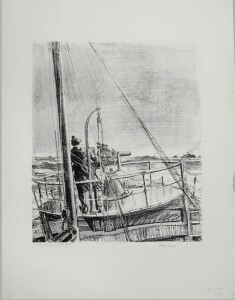 The first annual report explained that these CGMM ships were “intended primarily to cooperate with the British shipping in supplying the necessities of war and in times of peace to provide the means of carrying abroad the produces of Canada’s farms, forests, mines and factories, without which Canada could not hope to take full advantage of the opportunity of expanding her export trade.” While there was an unknown number of civilian sailor casualties during the war, their work was essential in supporting the Allied war effort, and would prove equally important in the Second World War. 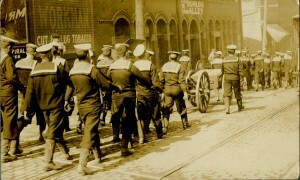 The Royal Canadian Navy expanded from a mere 350 sailors to over 5,000 from 1914 to 1918. Another 3,000 Canadians served with Britain’s Royal Navy. Over 150 Royal Canadian Navy sailors died during the war. 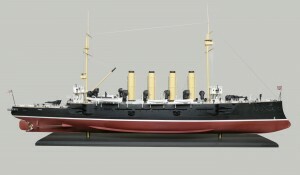 This is a detailed model of HMCS Niobe, an outdated British cruiser acquired by the Canadian navy at the time of its creation in 1910. For much of its career in the Royal Canadian Navy, the large, 11,000 ton cruiser did not have enough crew. 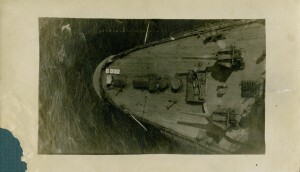 While Niobe saw action with Royal Navy warships in 1914 in searching for German ships along the east coast and in the West Indies, she served from the summer of 1915 in the Halifax Dockyard as a training ship. Niobe was damaged in the December 1917 Halifax explosion and sold for scrap in 1920.